What Does a Railroad Conductor Do? Railroad conductors work aboard trains and coordinate the daily activities of train crews. A freight train conductor also oversees the loading and unloading of cargo. The job can involve working on trains that cover long, national routes, or it might involve working on trains that operate only locally or regionally. On cargo trains, railroad conductors are in charge of making sure cargo is loaded and unloaded and properly accounted for. On passenger trains, conductors are responsible for maintaining a safe and orderly environment for passengers. This includes taking tickets, sometimes accepting payment from passengers who did not purchase tickets in advance, assisting passengers when necessary, and alerting passengers to upcoming and scheduled stops. Seniority generally dictates where a railroad conductor falls on a particular pay scale. Most of the data from the U.S. Bureau of Labor Statistics is for a broader category of railroad workers, but it does include a median annual pay for railroad conductors, which at $60,300 is slightly higher than the median annual salary for railroad workers as a whole. A railroad conductor's job requires a high school diploma, on-the-job training, and in some circumstances, certification. Training: Some lines send prospective railroad conductors to a six-week training program before assigning them to some additional form of training. This training can be done either on-the-job or in community college classes. Certification: Railroad conductors working on national or regional commuter railroads must pass a Federal Railroad Administration test to earn the appropriate certification. Being an effective railroad conductor typically requires some of the same soft skills necessary in other customer-service professions, but there are some physical requirements as well. Communication: Railroad conductors need to be able to communicate with other crew members in addition to being able to communicate effectively with passengers. Customer service: Conductors working on passenger trains are dealing with customers who often have questions or concerns or otherwise need assistance. Being adept at handling passenger concerns is an important part of the job. Stamina: Railroad conductors are on their feet all day, frequently on a moving train that might make frequent stops and starts. Good hearing and vision: Anyone working on a train needs to be able to hear warning signs and read and recognize signs to be aware of upcoming stops or potential safety issues. Job growth for railroad conductors is projected to decline by 2 percent for the decade ending in 2026, according to the U.S. Bureau of Labor Statistics. This is considerably worse than the 7 percent growth projected for all occupations as a whole. BLS attributes the projected decline to several factors. Demand for coal is down as more power plants are using natural gas, and an increase in pipelines decreases the need for rail transportation for oil and gas. 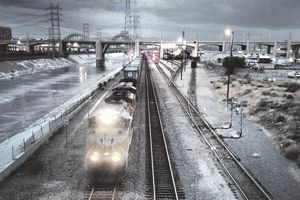 Although a lot of the job is conducted on trains, railroad conductors need to be able to work in all types of weather. It's a very physical job, requiring the ability to lift, push, and pull various weights and be able to readily sit, stand, and climb. It's also important that conductors can distinguish colors in order to read signs. Schedules for railroad conductors are dictated by rail schedules. Both freight and passenger trains typically run at all hours, so conductors often need to be available to work evenings, weekends, and even holidays. Conductors working on trains with long routes may spend days away from home, though federal regulations dictate the length of shifts. Trains that operate regionally or locally are more likely to allow conductors to maintain a regular shift. Many freight companies or passenger train companies have their own training programs for conductors or other railroad-related jobs. Advancing in the field requires experience, starting in rail yards and then on trains.